Hawaii. I've never been. Would I like to go? Uh, yeah. The first thing that comes to mind when thinking about what the ideal drink to be sipping on its sandy shores is something sweet out of a coconut. That's why its awesomely surprising that there's a good brewery on the the island of Maui. And not only are they a good craft brewery, but they CAN their beers! Which makes it even easier for their good brews to make it long distances without having to worry about being affected by the damaging effects of the sun. 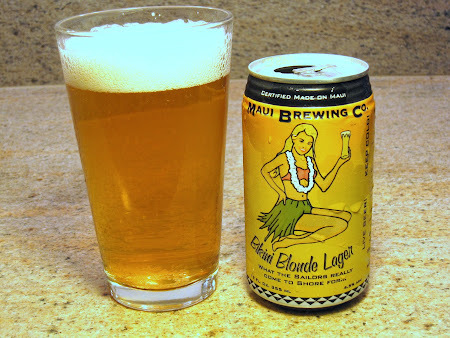 So the beer I'm reviewing here is the Bikini Blonde, of the Lager variety. I cracked it and immediately noticed a foaming presence dying to escape the can. I granted its wish letting it flow into a pint glass. Underneath a nice, creamy head that didn't ever seem to fully relinquish laid a bright, clear, yellow and tasty looking beer. Upon sniffage, I got a mix of slight clove, biscuity/breadyness and just a hint of hops. When it hits the tongue it produces a light yet slightly pilsner taste with a creamy finish. I want to exclaim "fluffy" with this one. It also contains notes of orange peel and there's even a bit of spice to it. This is a great summer beer. I think if I ever make it to Hawaii, I'll be ordering this one at the beach. Barcade: Jersey City - JINXED! Crap. I guess I jinxed it with my post yesterday about the new Barcade location opening on Newark Ave. in Jersey City. Look what I found when I strolled by yesterday! "NO PERMITS" Uh oh. I'm hoping this is just a little snafu and not a sign of things to come. I've heard that new businesses in JC can get pretty caught up in red tape. Oy. Barcade: Jersey City has been made semi-official in an article in the Jersey City Independent. Since I live 3 blocks away, I figured I'd keep an eye on its development here on the blog. Above is what it looked like as of Wednesday July 14th. "Quando para mucho mi amore de felice corazón"
Well its been up to 100 degrees here in the last few weeks. And sometimes in this type of heat you don't necessarily want to reach for something massively complex. Something light and refreshing perhaps? Unfortunately, the concept of "light" beer has been spoiled by a few certain large corporations (I mean come on, they're corporations first and breweries second...or maybe third) . Thankfully, there are some breweries out there that recognize that you can brew a crisp, thirst-quenching beer without compromising flavor or involving cheap ingredients like rice or corn. One such brewery is Sun King in Indianapolis, IN. 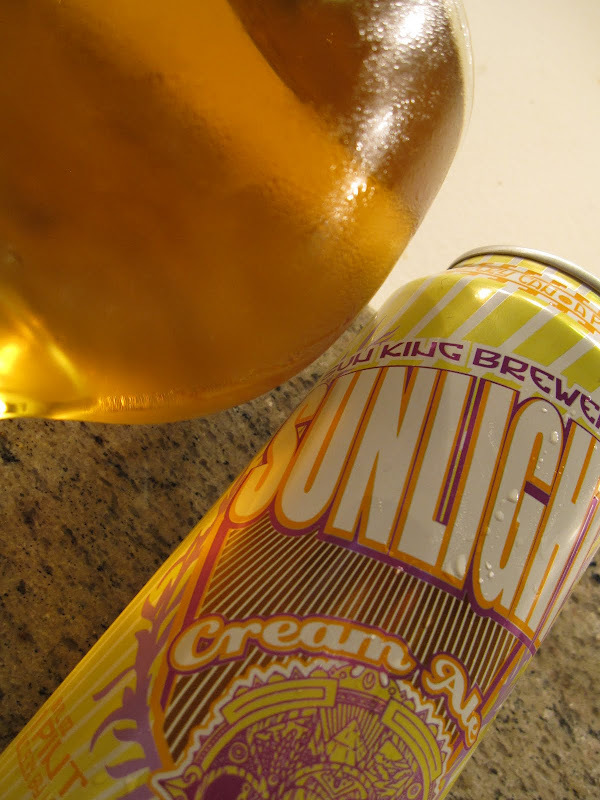 Their Sunlight Cream Ale is one of the most refreshing of the lighter-side of craft beers I've had in awhile. Upon cracking and pouring, this beer's head dissipates rather quickly revealing an incredibly clear amber awaiting your first sip. Not yet! First smell the thing. If you do you'll note a sweet, fruity almost cidery aroma. The taste is similar; first thing that hits you is the honey/fruity sweetness. Its not overbearing, though, as it leads to a slight hop presence followed by a hint of creaminess on the back end. I hesitate to use the cliché of post-lawn mowing beer, but man...this is just an excellent beer to drink after.... weed-whacking. 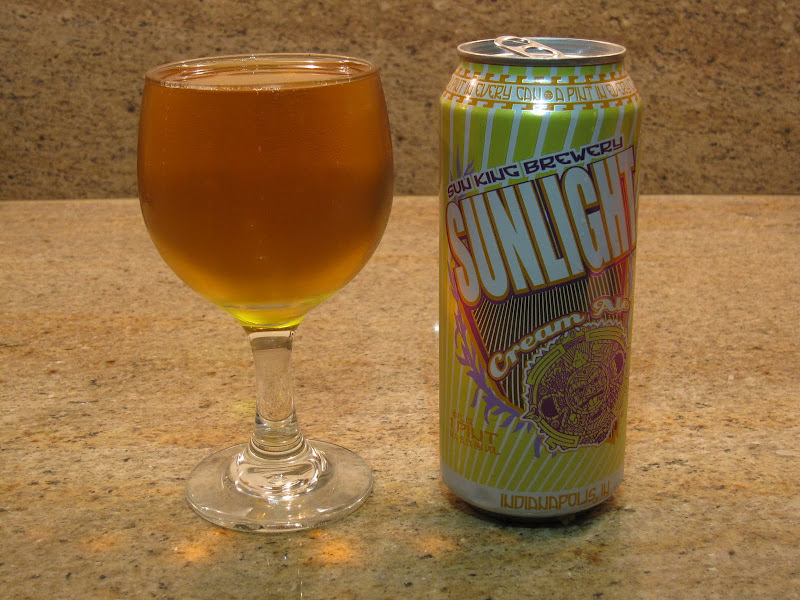 Also, congrats to Sun King on winning a Silver Medal at the World Beer Cup for this brew! Just a quick addendum to my previous post. I had previously mentioned that there was a Duane Reade on Broadway around 35th St. that had a small selection of craft beer, but they were displaying it in the window of the store. The photo above is from the morning, but after the sun comes around in the afternoon, all of those beers are in direct sunlight. At least they have the sign part blocking some of the beers toward the back of the shelf, but its still pretty bad. I've been debating whether to buy one of the beers to see how terrible it is OR to ask the manager there why they put them in the window.